The intensive summer repertory schedule at Pitlochry Festival Theatre bears an extra weight of expectation this season, with long-standing artistic director John Durnin having departed after fifteen years towards the end of 2017. 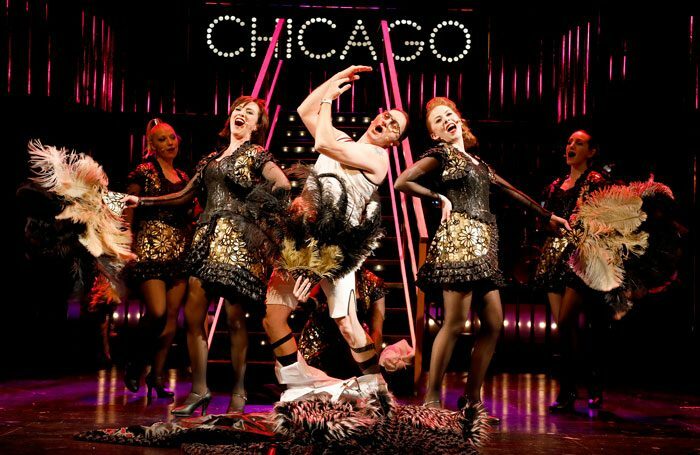 His traditional preference for opening on a celebrated musical means that associate director Richard Baron – drafted as this year’s season director – is now in charge of this timely revival of Chicago in the Perthshire countryside. Amid an ensemble of fifteen performers (who will work across six shows between now and October) and nine musicians, the plum female lead roles in Ebb and Fosse’s musical are well cast. Lucie-Mae Sumner’s Roxie Hart bears both studied fragility and raw ambition, which Niamh Bracken’s Velma Kelly maintains a vampish confidence that stays strong as her younger rival supplants her. Billy Flynn, the showbiz lawyer tasked with representing the pair of murderous choristers in 1920s Chicago, is played with greasy, smooth-talking charm by Carl Patrick, and Irene Myrtle-Forrester is their tough prison matriarch with a deep, honeyed singing voice. All are forced to physically work hard by Chris Stuart-Wilson’s brisk and inventive choreography, as, for example, Roxie is convincingly worked like a puppet by Flynn during the alibi-concocting We Both Reached for the Gun and the massed ranks of female jailbirds dance with designer Charles Cusick Smith’s sets of wheeled, golden prison railings for the Cell Block Tango. From Smith’s black, sequinned outfits to Wayne Dowdeswell’s unobtrusive lighting designs, everything on stage is set to not distract from the excellent ensemble work that really makes this show. Baron also intimates in the closing moments this Nixon-era musical’s keen contemporary relevance, as the truth is stage-managed by lawyers and an easily impressed media.